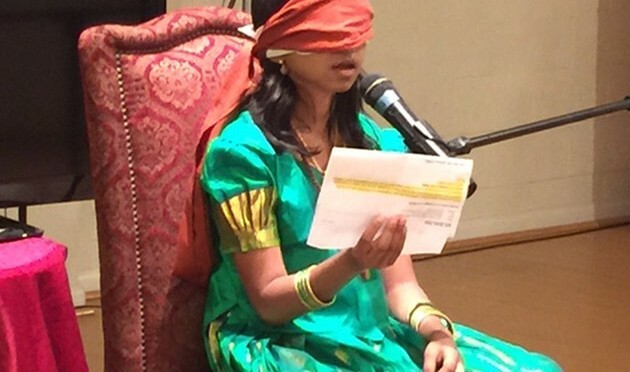 Nine year old Yogamaatha, from India, astonished onlookers in the United States recently, as she applied three blindfolds over her eyes and proceeded to read sentences from the piece of paper in front of her. Yogamaatha claims that she attended a course at Gurukul, in India, where she was initiated by a Guru and now possesses the unique ability to see with her third-eye. She states that this mystical power is a “learned ability”, opposing those who believe that gifts like these, are only for the chosen few. Not only can she read blindfolded, this nine-year old states that she can also ride a bicycle through traffic and dodge cars. Yogamaatha, is not the only child who has facilitating the teachings of the Guru’s in India. 12-year-old Ma Nithya Maheshwarananda from Dallas, USA says she opened her third eye just over a year ago while attending a three-week program.